I am back home now. I wanted to post on the last few days of my trip after my visit at Warren's. 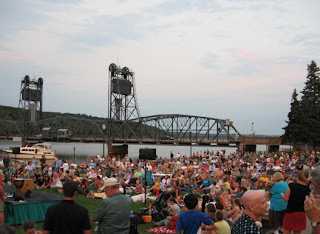 Below is a shot from the banks of the St. Croix river in Stillwater. I went down one evening and enjoyed some music along with all these folks. It was nice to just relax, everywhere I went on my trip felt comfortable and homelike. On Thursday I headed up towards Taylor's Falls. On the way I stopped by to visit Guillermo Cuellar's studio. He was in Peru (and thankfully uneffected by the earthquake), however his wife Laurie showed me around and I bought a nice bowl and yunomi. Guillermo has worked on and off with Warren through the years and I really like his work. 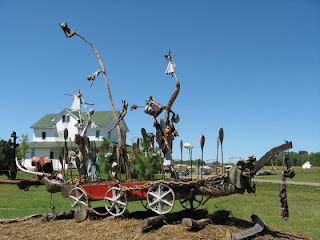 After that I stopped by Franconia Sculpture Park. It was nice to just hang out there and walk around the fields looking at all the art work. There are several residents working there. The big farm house is for their housing and there is a big work yard with hoists, welders, and all kinds of stuff I don't know anything about. I also visited Taylor's Falls. It's a nice little town with shops and resturants etc. 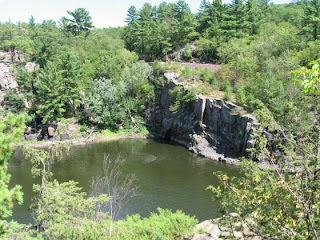 There I went into Interstate State Park and climbed around on the rocks and enjoyed myself up high above the river. After a couple of hours I headed in to town and had coffee before going off to see the potter Linda Christianson. I'll write about my trip to Linda's later so check back in .